That is one goofy design. I can't believe Zenith produced it. I don't what the seller means by it needing "new boots"! By the sideways pics and price I think the seller is a little goofy himself! I'm no Zenith expert but that model may be a prototype. Look at the label below the cabinet. It contains the dimensions of the cabinet along with the cabinet's manufacturer ID (Rider Furniture Company Inc. Monticello, Indiana USA.) That's typical with sample and prototype cabinets supplied by cabinet manufacturers for radio manufacturers to try out. This particular model may never have gone beyond the research stage. If that's the case then this may be a one of a kind model and would certainty be an interesting addition to any serious Zenith collection. Boots are the missing upholstery brass tacks/feet. Even the chassis doesn't have a serial number. The speaker is dated 40th week 1946. There is a serial number on the tag. The tops of the digits are just barely visible. Looks like it's a 6D030 in some kind of custom cabinet. Just because the label says "Zenith" in the customer field on the bottom doesn't mean it was actually done for the Zenith corporation. It could be referring to the customer who brought in the Zenith! 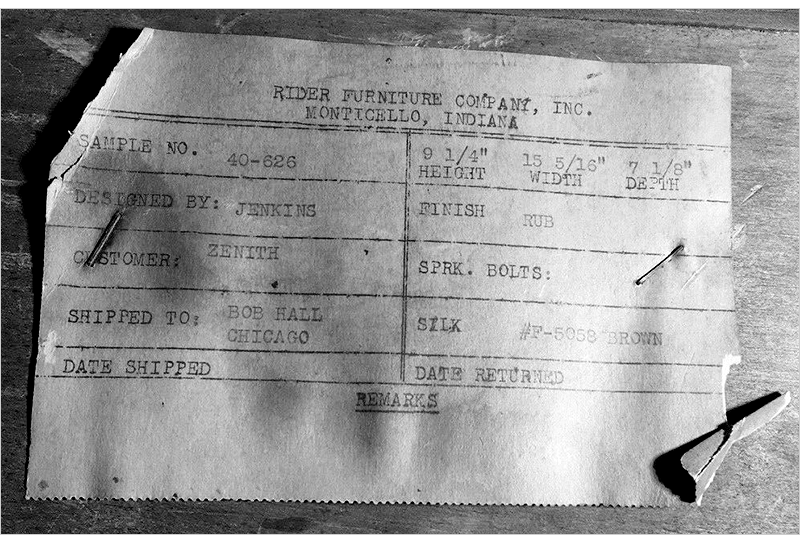 Yes, I agree that it was apparently a prototype/sample made by Rider Furniture for Zenith. It certainly is an oddball and strange looking 'to boot'. By the way, I contacted the Ebay seller. The serial number on the chassis is C190853. Zenith had cabinets for their model lines built by several outside vendors, like Tell City Furniture Company and Evans Products. Evans manufactured the resultant popular 6D030 designed by Zenith's consultant Jack DeYoung of Grand Rapids. It was NOT designed by Charles Eames. I commonly see--on Ebay and elsewhere--Eames mis-attributed as the designer of the 6D030 molded plywood cabinet. I have documentation to support my claim. Jenkins must've been drunk. That thing is ugly! And the knob is in a terrible position in regards to the pattern of the wood. If that is a legit prototype, Zenith must have been humoring some big distributor or something. It is just way out of character with their usual design philosophy. Which is why it never made it to market. Zenith was simply trying out different cabinet designs to see which ones would work and which ones wouldn't. This is typical for a research and marketing department. I know if I was the winning bidder, I'd be talking to ebay. The winning bidder (shill) already left feedback! With that being a one-off radio and even though not all that valuable, someone should drop a dime. BIN at $50. That's not to unreasonable. The winning bidder actually bid the high bid almost 4 days before the auction ended. This doesn't seem consistent what what a normal shill would do by waiting for someone else to bid then slowing bidding against them and running up the auction price. Maybe the winning bidder backed out of the sale?